The Silva Mastery Seminar teaches you the “WHAT and WHY” behind the foundation of the Silva Method. You’ll be better able to apply the How To Do It Applications. 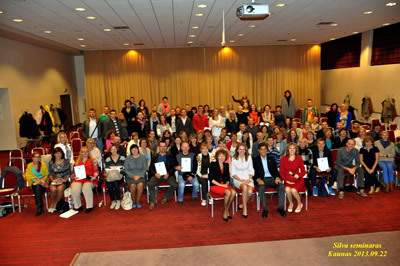 Ken’s Mastery Seminar is acclaimed by tens of thousands of Silva Method practitioners all over the world, since 1984. Ken will help you to gain a deeper understanding, connection with, and integration of Silva’s core principles. It is about you breaking through that which has been holding you back from being your very best. Do you remember, upon completing your initial Silva experience, how everything seemed to fall into place? There was a natural rhythm. You were in the flow. Would you like to allow that to happen more consistently? Whether you have been practicing your Silva skills or have let things slide, the Silva Mastery Seminar is the ideal opportunity for you to tap back into that natural rhythm. You’ll launch yourself to new levels of clarity, focus, and balance with proven outstanding results. Ken designed this program for you, the Silva practitioner who wants to enjoy more consistent lasting results. It is based on Ken’s practical experience with tens of thousands of Silva graduates in over 20 nations over a 47-year span. It is an experience with over six unique dynamic meditations. And some of the latest research to help you make the shifts you’ll need to navigate these times with poise, confidence and a level of certainty to manifest your Life Vision. Identify hidden obstacles that may be holding you back. Develop and experience proven techniques to eliminate them. Develop value-based goals that can leave you with a clear sense of mission and purpose. Reprogram your nervous system to stay healthy & productive in spite of it all. Integrate the Silva skills more effectively into your life. Manifest more of what you really want. Mastery: Creating lasting breakthroughs to integrate and master your Silva Skills. It’s not what you know or even how much you know that makes the difference. It is what you can do with what you know. Insight: You will Gain insight and learn from the cycles of personal and spiritual growth. You will develop new, proven techniques based on current research in Neuroscience and the emerging science of Energy Medicine to balance body, mind and spirit to get it going again and keep it going. Wisdom: Learn to Awaken and focus your higher awareness to manifest your highest good and purpose. Self-Awareness: The foundation for psychological health, wellbeing, and balance. You will feel the difference as you mobilize healing emotions. Optimal Health: Learn the 5 steps to neutralize toxic emotions to enjoy vibrant health. Life Vision: Align your goals with your purpose and gain motivation to get what you really want. You will learn to enhance your personal connection to higher intelligence and benefit from inner guidance. It is one of Jose Silva’s most profound concepts. Resilience: Eliminate self-sabotage, enhance self-confidence, deepen feelings of self-appreciation and develop the skills of “bouncing back”. Learn and develop the skills to consistently thrive in these times. Harmony: Learn from fear, guilt, doubt, and anger to maintain emotional integrity. Transform and release “stuck” patterns of distress. Develop powerful new and unique techniques to manage and prevent feelings of being “overwhelmed”. Patience: Deepen compassion and understanding for enduring patience and richer relationships. “Ken Coscia is a FABULOUS Silva teacher. graduates of Life and Intuition System and/or the BLS.